Stitchex allows you to manage your customer invoices for the sales orders that you have received. Stitchex also provides multiple invoice strategies for you and your customers with multiple payment terms whether a single invoice, multiple invoices with a down payment, invoices with partial shipments or even invoices for products provided on consignment with an expectation of a return. This page will guide you through the various invoicing options present in Stitchex, how to customize you invoices. For information on exporting invoices to your accounting software please see our guide to integrating with Xero. When you confirm a sale you will be presented with a choice of invoice method. You should decide which invoicing method makes most sense for your business (or for the particular customer). You will not be able to change it later without deleting existing invoices before changing invoicing method. Choosing SINGLE INVOICE will let you create a single invoice for the entire contents of the order. Choosing DEPOSIT AND BALANCE will start a two invoice workflow. First a (VAT) invoice will automatically be created for the deposit. The goods value will be adjusted down to the percentage you specify. Later you will create a second invoice for the balance (usually before shipping the goods). Any early settlement discount will be applied to both invoices. Shipping costs are not included on the deposit invoice (but will be included on the balance invoice) and there is no way to accept a deposit on shipping costs. If you select DEPOSIT_AND_BALANCE, you will see THE "Create Deposit Invoice" button in the center, top portion of the screen as shown in Figure 3. In the Deposit percentage field, type the percentage of the down payment that you would like to collect from the customer in advance. If you click on "Create Deposit Invoice" as shown in Figure 3, you will then see an outstanding balance for that customer based on 15% of their Sales Order with a "Next Payment Due" date as shown in Figure 4. In addition, you will see a Deposit Invoice with the amount of the order displayed minus the deposit amount. Choosing SHIPMENTS will allow you to create an invoice for each shipment you create. The invoice will cover only the goods in the related shipment. As you create your Pick Tickets, you'll notice the Status bars will show nothing paid/invoiced and nothing shipped. If you have multiple shipments for different amounts, you would create invoice for each shipment. 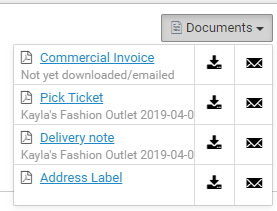 After you Create the Invoice, you will see the invoice number associated with the Shipment directly below the shipment. 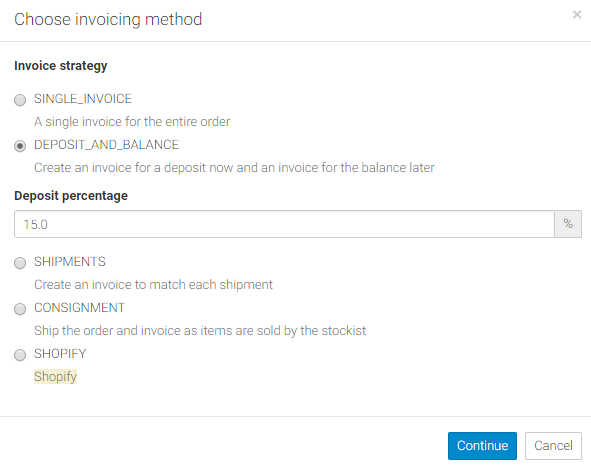 This method is different from the other two methods described in that you do not have to actually "Ship" before creating the invoice. Stitchex will not track these items to closure. You will manage those within your Shopify. Also, for any Shopify orders you brought over through the "Pull" seeding method, those will show up with Shopify Invoice method as well. See "Bulk Updates for Shopify" syncs for more information. You can edit these invoice details by clicking the edit icon in the upper right corner of the invoice. The Due Date field is automatically calculated for invoices based on what is set as the default under Settings>Invoices in Payment Terms. The Payment Terms defined within the customer profiles do not calculate due dates. They are only displayed on the paperwork. 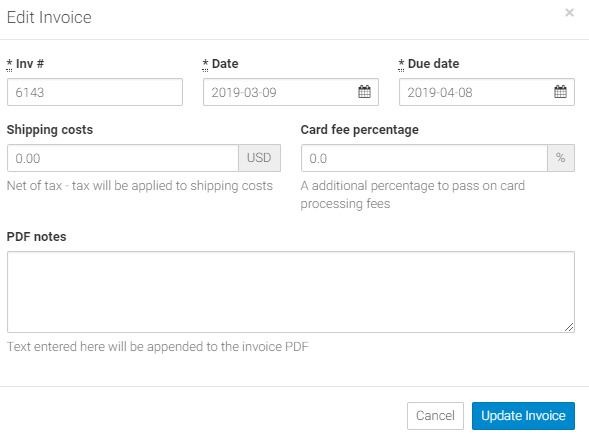 Use this edit invoice method to manually override an invoice due date if it needs to be different than the Payment Terms defined under Settings>Invoices for this particular invoice. 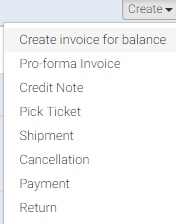 To create a Commercial Invoice, navigate to your Pick Ticket/Shipment, select "Commercial Invoice" from the drop down menu on the top right corner.